There are few aspects of growing a business that are easy. But when you think about the big picture, one of the most significant challenges — besides hiring attractive, productive interns — is customer acquisition. Not every business scales like Facebook; many have to fight tooth-and-nail for every client, sell their firstborn, do whatever it takes. And once those customers are on board, the most successful companies make it a point to listen to them, hear their feedback, iterate, tweaking the user experience of their business/service/platform until the cows come home if that’s what’s required. Sure, there’s something to be said for the “ask forgiveness not permission” strategy, but the recent PR fiascos of Airbnb and Path prove, if anything, that prioritizing transparency and communication with customers can save you from a lot of headaches. That’s why CRM platforms exist — or should exist. To help businesses acquire new customers, and open up communication channels to help keep customers and companies engaged. And we’re not just talking enterprise. Jon Ferrara, the Founder and CEO of Nimble thinks that most current CRM systems are broken, Salesforce.com among them. Ferrara is also the founder of Goldmine, a CRM company he sold for over $100 million in the early 2000s, and two years ago, he returned to the still-stumbling CRM arena to try to get social right — with Nimble. The social revolution having taken hold, businesses have come to realize that the best way to become a part of their customers’ conversations is to be where that conversation is taking place (in realtime) — on social media channels like the Twitters. When it comes to social CRM, few have been more gung-ho about its importance than Salesforce.com, which has adapted its cloud to tap into social networking channels in an effort to enable its enterprise customers to strengthen relationships with their users via social media. Hence Chatter and Radian6. The “socialization” and “consumerization” of enterprise is very definitely taking place, but enterprise is more tectonic in its transitions to new models, than, say, SMBs, which have the advantage of being more nimble and flexible. But, to really nail social, businesses can’t just stack social functionality onto legacy CRM platforms, they have to build social into their infrastructure from the ground up. That’s what Ferrara has been doing with Nimble, smartly opting against going toe-to-toe with enterprise clouds like Salesforce, and instead targeting the CRM-underserved crowd of SMBs and startups. 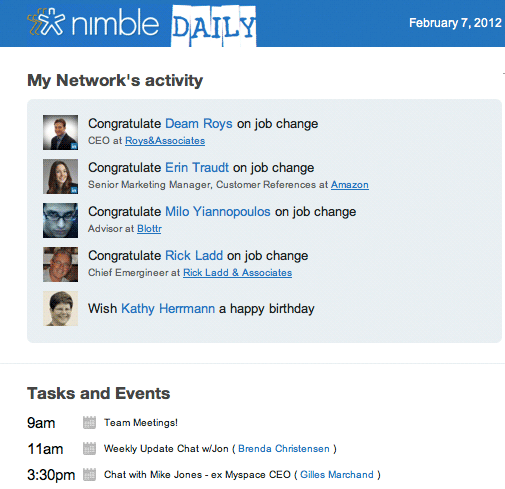 When we first covered Nimble’s launch at DEMO a year ago, one could already see the potential appeal of the service, as it was offering a social relationship manager that enabled individuals to easily connect their contacts, calendars, and communications. Integrating with email, Facebook, Twitter, and LinkedIn, Nimble pulled them into one, unifying platform that allows users to, say, receive an email from a particular person and pull up previous conversations with that person from any platform, social or otherwise. Whereas old-school CRM systems stick to sales lead forecasting and management platforms that require users to BCC and CC messages, duplicate activities to link them to contacts, etc., Nimble offered the ability to automatically connect your conversations and activities — emails, social conversations, and calendars — to the people you’re having them with. Rocket science? No. But still not really done well yet. So Nimble started with a free service that was aimed largely at individual users and has since been expanding on that model to offer functionality tailored more to B2B interactions with some simple sales and marketing add-ons. This move is culminating with the launch of Nimble 2.0 today, an upgrade that makes it increasingly clear that Nimble is making a platform play, with broad strokes to build an all-in-one CRM platform that actually helps businesses increase their social engagement. What does that mean? 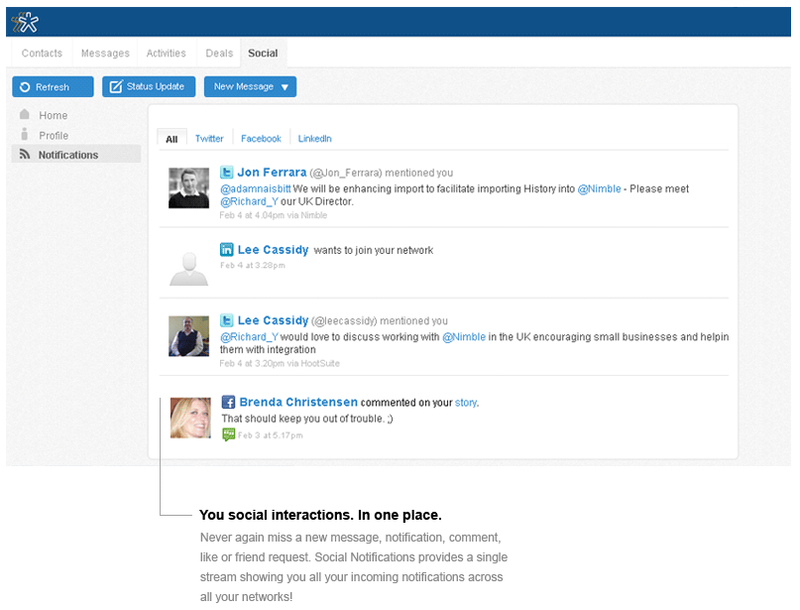 Well, for starters, Nimble now offers unified social notifications all in one place. In the old model, businesses (and individuals) are stuck having to switch between windows, tabs, or apps to stay on top of their messages, notifications, likes, and requests on Twitter, Facebook, LinkedIn, etc. 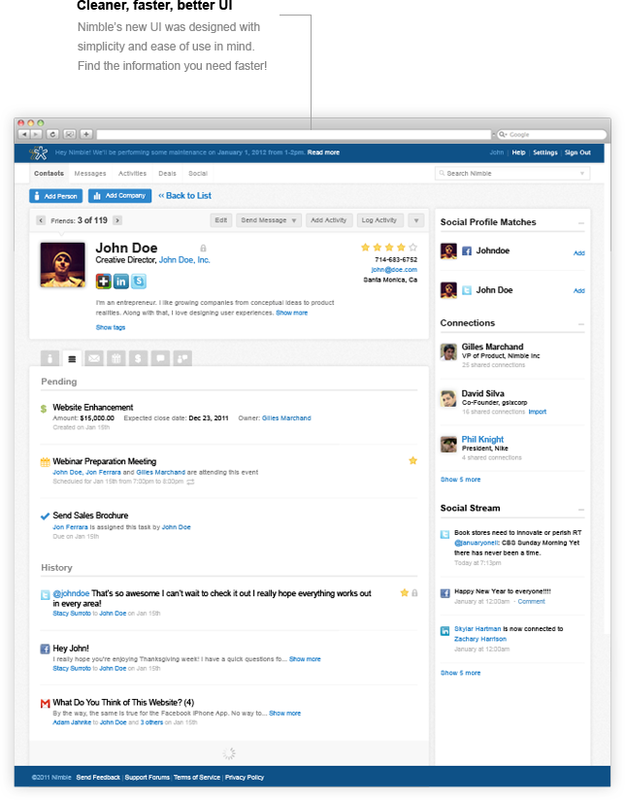 Nimble puts your business’ social accounts into one stream, allowing you to follow, respond, engage from a single dashboard. And, to give your business’ marketing and sales teams an idea of where to start engaging each day, Nimble now sends out an email “full of engagement opportunities” — in other words, a hit list of the most important news from your social networks, like friends, colleagues and social media connections changing jobs, your upcoming meetings, and, yes, even birthday notifications. The idea is to present businesses (and individuals) with a whole new slew of opportunities to reach out to customers and contacts for some organic engagement. This is great because it’s one piece of answering the question — “who should I be talking to that I’m not?” — important to both busy/lazy networkers as well as sales/marketing teams. At its heart a sales platform, Nimble is all about contact lists, and making those contact lists more dynamic and likely to push leads. Thus Nimble 2.0 brings a new, redesigned user interface to bear on your contact lists, allowing you to pull together related messages, activities, and deals, or add custom fields and tabs to contacts to support the collection and storage of your industry data as well as targeting communications to particular contacts. In terms of privacy, Nimble 2.0 offers users the ability to decide which of their connected email or social media messages get shared with their colleagues, or marketing teams, and which stay private. But perhaps most importantly, beyond unified social notifications, the platform is now offering some more key, third-party services, as it now integrates with online form builder, WuFoo, to create forms, link web visitors to those forms, or embed them on their sites; with MailChimp‘s scalable email marketing platform; and HubSpot’s inbound marketing software that enables users to track their leads, assigning a point system to the lead generation and conversion process to let users see how close their leads are to make a purchase. In these latter features, it’s easy to see how Nimble could become increasingly appealing to SMBs and startups. The all-in-one platform that allows you to send and manage email, track and manage tasks, calendars, and contacts, as well as getting on top of our increasingly messy (and frequent) social media communications — this is all huge. Throw that on top of a cloud infrastructure and add a UI that doesn’t burn your eyeballs, you’re cooking with oil. Sure, the basic stuff has a clear use case/benefits for individuals alone, but with its HubSpot/WuFoo integration, businesses get tools to manage (and close the loop on) their marketing initiatives. There’s still a lot to be done here, and when Nimble finalizes its “planned integrations” with Get Satisfaction, Yammer, Zendesk, Assistly, Quickbooks, and Freshbooks, the value prop will only get higher. With all these features I’ve thrown at you, it may seem more confusing than it is. In playing around with the platform, I’ve been impressed with its simplicity and user-friendliness. It’s pretty intuitive, and it learns more about you as you go. To that point, Nimble now has over 30K registered users from more than 2,800 companies. According to the Nimble CEO, the average user now spends 3 hours a day managing business contacts, and the company has signed up over 250 resellers worldwide. Not bad for a SaaS B2B app that (according to Ferrara) hasn’t spent anything on marketing. The Founder has spent the better part of two years building the service, sinking $2 million of his own money into it, and adding 20 engineers over that time. In January, Nimble raised $1 million in seed capital from Mark Cuban, Jason Calacanis, Don Dodge, Dharmesh Shah, and Google Ventures. And, now, with Nimble beginning to be an actual platform, the team is starting to raise a series A (which we hear could be in the $5 to $10 million range). You should always be wary of pollyanna bloggers, as blind optimism is never good for the ecosystem, but, still, my Spidey sense is telling me that Nimble is really onto something here and that, if it can hurry up and open some APIs (and maybe an app store) to let developers build apps for the platform and, in turn, can quickly (but meaningfully) integrate with marketing, tracking, and analytics tools that take the load off SMBs and help them run operations smoothly and more effectively, this could be a big business. Of course, I’ve been wrong before. Note: Nimble is offering TechCrunch readers 90 days of free access to its “Business Version” (i.e. paid service), which the first 200 readers can access by following this link. For more, check out Nimble at home here.